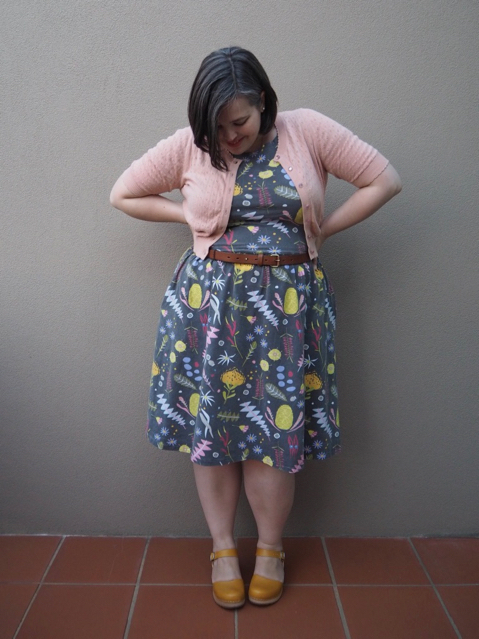 This entry was posted in Uncategorized and tagged cardigan, colette, cool, DIY, dress, funkis, princess highway, trenery by lillipilli. Bookmark the permalink. I like the grey background to the fabric – it seems more like a natural, indigo colour. I would go for another pair of Gertrudes. The height is really good and you don’t have to worry about picking up sand/grit. The pink ones are lovely! And they would also go with your lovely new dress and your cardigan. You look absolutely fabulous! ? I love the gray colored background! It gives a softness to the bright colors of the flora. Very pretty! Hi! Spoonflower is so much fun, but yes, have been warned off dark backgrounds. Did I see you at the Comedy Theatre tonight?! Didn’t want to come over and say “I read your blog” in case, you know, it wasn’t you! 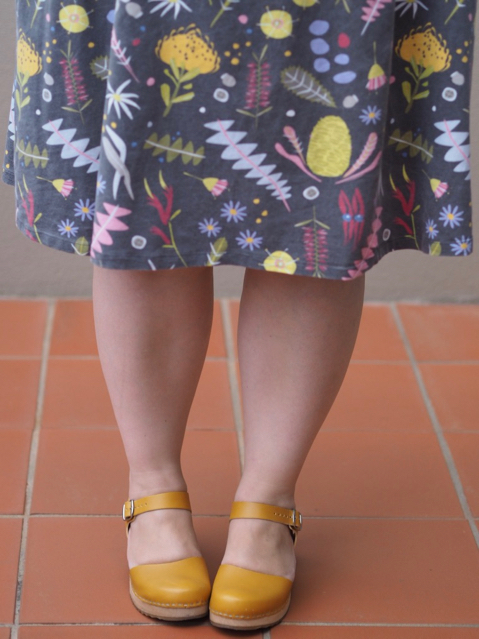 I also have a Moneta dress in Spoonflower cotton jersey with a “black” background print. I like the grey that it ended up being, but it was a little disappointing to not turn out how I had originally envisioned it. The cotton is lovely to wear against my skin though. I think their Modern Jersey fabric base takes dark colours a little more convincingly. te acompanhando aqui do Brazil . I’ve had three pairs of funkis but unfortunately with every pair, the buckles came off or broke after a period of time. Oh no! That’s no good! I haven’t had that problem yet – have you spoken to Funkis? 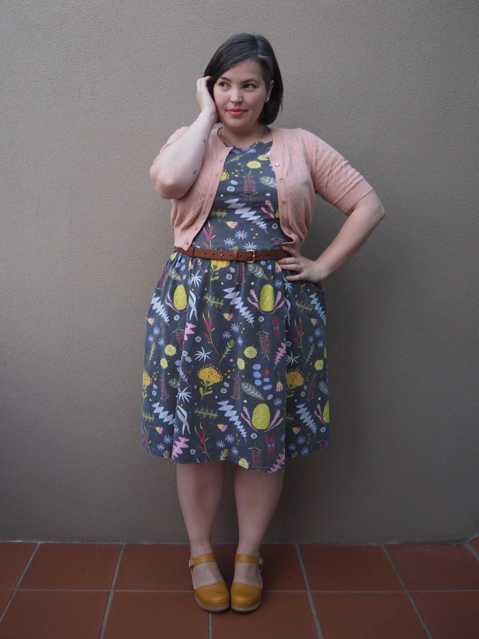 I just sewed my first ever dress yesterday! I’m already addicted. 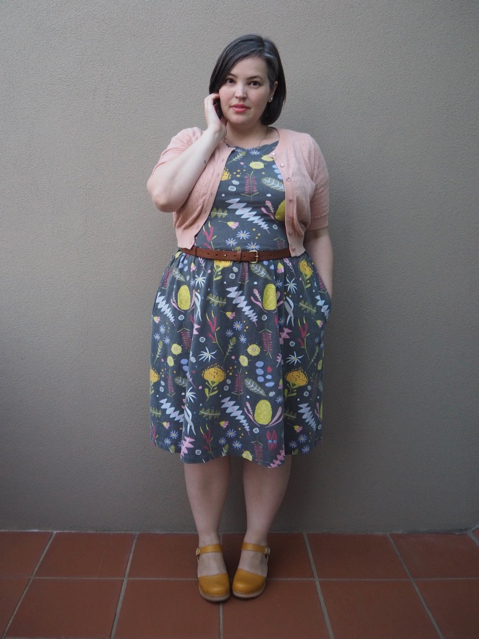 I absolutely love this dress, and was wondering which pattern it was! It’s super flattering and doesn’t look particularly difficult. Could you share a link or a picture of the pattern or something?